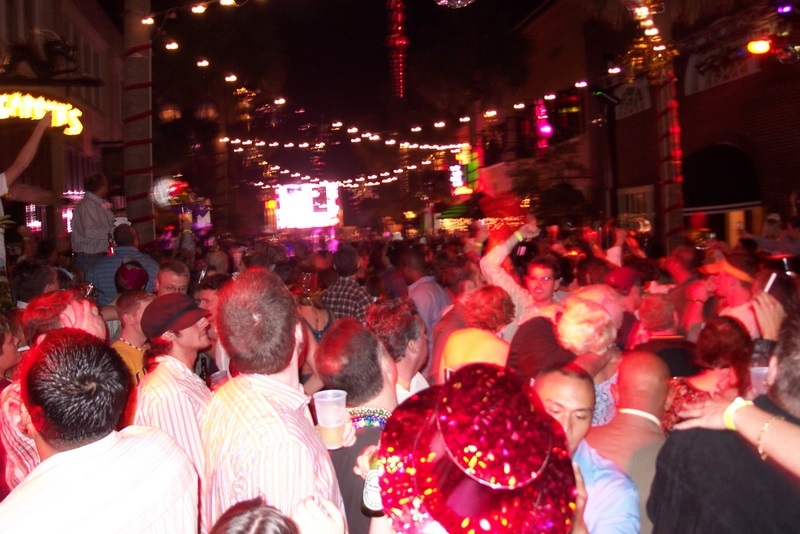 After the Halloween Parties in October, New Years Eve is the best time to check out Downtown Orlando. The city already comes alive each weekend as it is, but throw together the event of New Years Eve, and college students and alumni of the four schools playing in Orlando’s two bowl games (Russell Athletic Bowl and Buffalo Wild Wings Citrus Bowl) and this provides a recipe of craziness. The theme parks draw crowds for their firework spectaculars but Downtown Orlando is the place to be for a traditional New Years Eve experience. 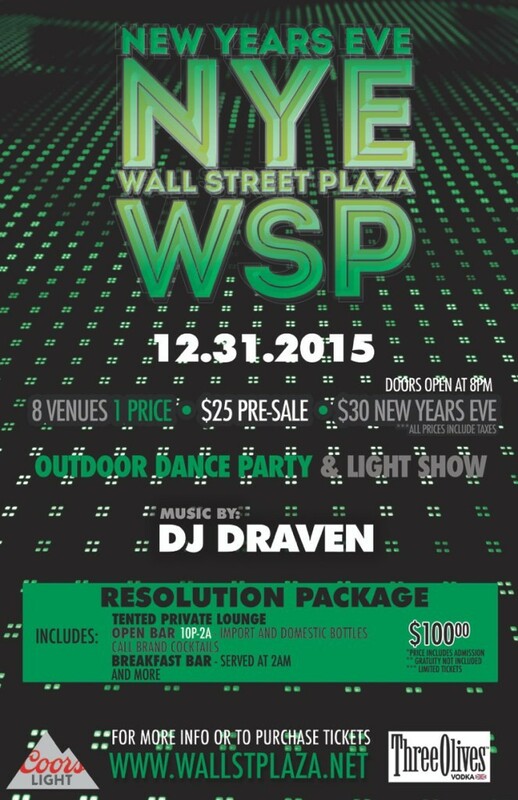 There are options everywhere to party during New Years Eve but your two best bets are Church Street Entertainments New Year’s Eve Street Party and Wall Street Plaza’s 2016 NYE Party. 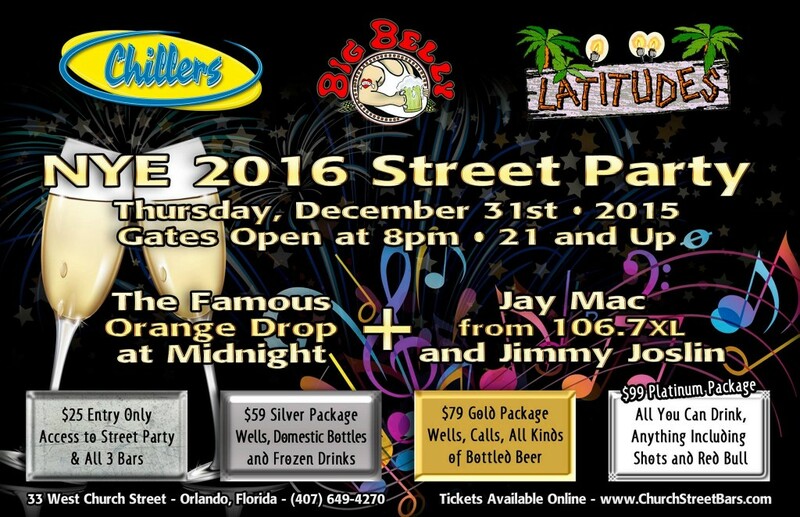 At the Church Street party, an Orlando version of the NYC ball drop occurs with their Orange Drop at midnight with fireworks that includes access to their nightclubs of Chillers, Big Belly Brewery, and Latitudes (see flyer below). There is something to be said to say that you were able to countdown the New Year on Main Street USA at the Magic Kingdom on New Years Eve. I celebrated New Years this way one year with party hats and party horns and had a blast. The streets are packed and fireworks surround you as you experience a true international New Years Eve countdown. Disney’s Hollywood Studios will be launching fireworks with a new New Years Eve show to bring in 2016. Epcot has several DJ’s located around World Showcase and a special fireworks display at Midnight. Outside of the theme parks, Disney World will have an all-inclusive New Years Eve party at the Yacht and Beach Club Convention Center featuring Vanessa Williams to bring in 2016 that cost $300/person called Countdown to Midnight. At Universal Orlando, Citywalk brings in the new year with several different party zones located within it’s clubs as well as a Midnight champagne toast and pyrotechnics display. Doing a search online for New Years Eve events at Disney Springs or Downtown Disney is not going to bring back any good results and there is a good reason for that. Pleasure Island used to celebrate New Years Eve every night of the year but those days are long gone. New Years Eve at Disney Springs in 2015 is a little more low-key that consists of going to one of their restaurants on property, bowling at the Splitsville bowling lanes, catching a movie at the AMC, or watching a performance of Cirque Du Soleil’s La Nouba. Another lower key event for New Years Eve is at the Atlantic Dance Hall at Disney’s Boardwalk that you can find more information about here. Click Here to read about more great things to do around Downtown Orlando during the holiday season and click Here for more events going on for New Years Eve. This entry was posted in Events and tagged annual events, citywalk, december, disney world, downtown orlando, fireworks, holidays, magic kingdom, new years eve, orlando, universal. Bookmark the permalink.